Bought the missus a brand new car 3 weeks. I bought her when I was at supercheap a air freshener. It leaked on the dash and has done this. If it has done that to the plastic what would stop it from eating through and melting then catching a light. Must say i'm pretty p!$$#d about now at how the simply air freshener can do so much damage. I would take it back as a warranty claim, just dont mention the air freshener. 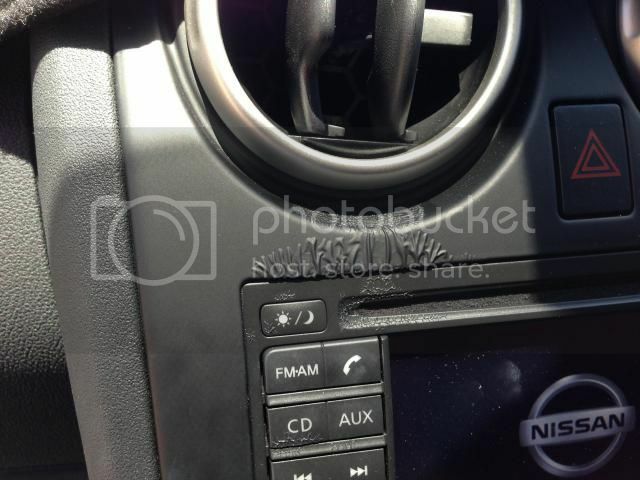 As well as the freshener I think it says something about the quality of Nissan plastic. I'd be more inclined to get onto Dept. Fair Trading/Consumer Affairs (or whatever it's called in your state) and Supercheap head office - that's just plain dangerous and perhaps shouldn't be on the market. Does it have the ingredients listed on it anywhere? Warnings about what materials it shouldn't come in contact with? Geez mate, that is a shocker!! Wouldn't have thought it'd do that hey... Was gunna say something about bloody Nissan's, but, hang on... Hmmm... ... ya sure it's not a Toyota with a Nissan stereo? My partner works for Nissan told her to put in for a warranty. But no go! $340 for that bit of plastic. The parts manager said that's common with air fresheners their like paint stripper. Last edited by patrol17 on November 6th, 2013, 4:34 pm, edited 1 time in total. The missus I might just go and see what the company has to say or offer. Ya property value just went up mate .... Geez, they don't miss ya with the price of plastic hey!! Might fit a Patrol badge on it lol yes they sure know how to charge for a piece of plastic. patrol17.. Don't mean to rain on your picnic, but I don't think you would have a chance in hell of claiming warranty.. Most air fresheners contain a solvent so the scent can evaporate into the surrounding environment, much the same as female perfumes ect.. From the photo it would seem that the paint (coating) has been effected by a solvent.. I've been told that other stuff like some skin moisturisers and also some sun blocks can have an effect of the coated surfaces. Some pieces are painted with a 'one pass' system that leaves a very thin coating which is susceptible to harsh cleaners and constant rubbing. For example, the windows switch plates on a popular 4wd..
Tonight while we did our weekly shop at woollies we bought the xmas tree style air freshener lol can't go wrong with one of them now. patrol17 wrote: Tonight while we did our weekly shop at woollies we bought the xmas tree style air freshener lol can't go wrong with one of them now. Just dont let it touch the dash! Heaps of new car plastics are painted now. You don't get silver plastic, it's black with silver coating. The active ingredient in the air freshener helps it evaporate is obviously like a paint thinner. However, if the product leaks and damages vehicle interiors, chase it up with Supercheap Auto. They'll follow it up with head office whom will get in touch with the supplier of the inferior product to reach an agreement of compensation with you, that's if they admit their product does do this, in which case, if they don't you would have to prove it did by highlighting the ingredient that did it blah blah... Oh just buy a new plastic and get Supercheap to pull it out of stock. Not many honest companies like this around. I use pump sprays on the cabin filter and onto the carpets, but never near plastics because of this. The air freshener was designed for cars and from the looks of where it melted I'm guessing it was one of those which are specifically designed to hang on the plastic vents. The manufacturer and/or supplier (since Supercheap tend import all their own products they are most likely to be both the manufacturer and supplier in Australia) would have known that the liquid can cause damage to plastic like this. It is then reasonably foreseeable that a faulty container could leak out and cause this sort of damage. Anything bought after 1st January 2011 is covered by the Competition and Consumer Act 2010 and that act allows you to claim for any reasonably foreseeable consequential lost. Unless there was a clear warning on the front of the packaging that this could happen then Supercheap are liable for the repairs. Contact your local state consumer authority for advice and try to get everything you can reciepts, bank statements, packaging to prove it came from Supercheap. Oh, this better be a warning to us all! Hope you could sort it out with them mate.